View and create subtasks directly from List and Board Views! 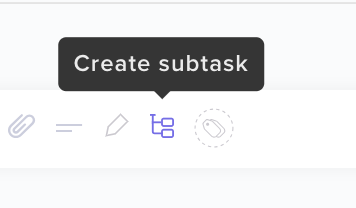 For a task that does not yet have an existing subtask, you can create one by hovering over the task and selecting the icon below! Flip the toggle shown below to enable subtask visibility when sorting and filtering! Sorting and Filtering in List View now shows subtasks as separate items! Utilize the Multitask Toolbar in List View to bulk-convert tasks into subtasks! Just select the purple dot next to the task/s you wish to convert and click the image shown below.